This is one of my grandmother's delicious AND healthy recipes. It's so easy to make and is ready in no time! The aroma will intoxicate you. 1. Sauté onion in olive oil and once translucent, push to one side of the pan. 2. Add washed chicken to other side of the pan and salt to taste and sauté for about 10-15 minutes making sure not to overcook the chicken. 3. Combine the chicken and onions, add curry powder and adjust seasoning as needed. 4. 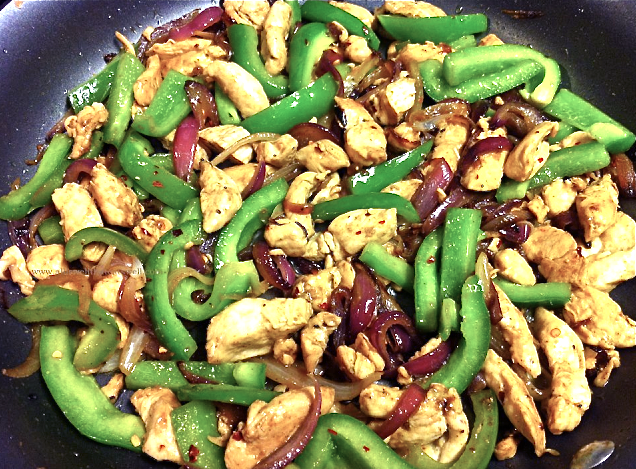 Add green pepper and red hot pepper flakes to taste and keep sautéing together until well cooked. 5. Remove from heat and serve in warm pita bread.